As a seller of vintage goods, I am fortunate to come upon some wonderful relics of our Mid-Century Modern era, a short lived but incredibly artistic and innovative time period. Many of the companies that produced these goods are no longer in existence, but there is one furniture company that has stood the test of time. That company is Flexsteel out of Lancaster, Pennsylvania. Flexsteel, originally founded by Frank Bertsch in 1893, is still in existence. The company changed names several times, but was eventually renamed Flexsteel for the incredibly strong and durable frame found in its upholstered furniture. At the height of the Contemporary Modern Movement in the 1960s, Flexsteel competed with the likes of Adrian Pearsall in sofa and chair designs. The strong points of the company’s innovations were the use of dynamic styles and vibrant colors on durable, printed nylon fabric known as “Astrolon, the star of Space Age fabrics.” Astrolon was considered furniture’s most durable fabric at that time (www.flexsteel.com/about-flexsteel/history). Here in my shop I recently acquired The Thunderbird couch, circa 1965. The fabric is the original astrolon and the piece measures nine feet long. Those incredibly heavy steel bands gird the structure together. 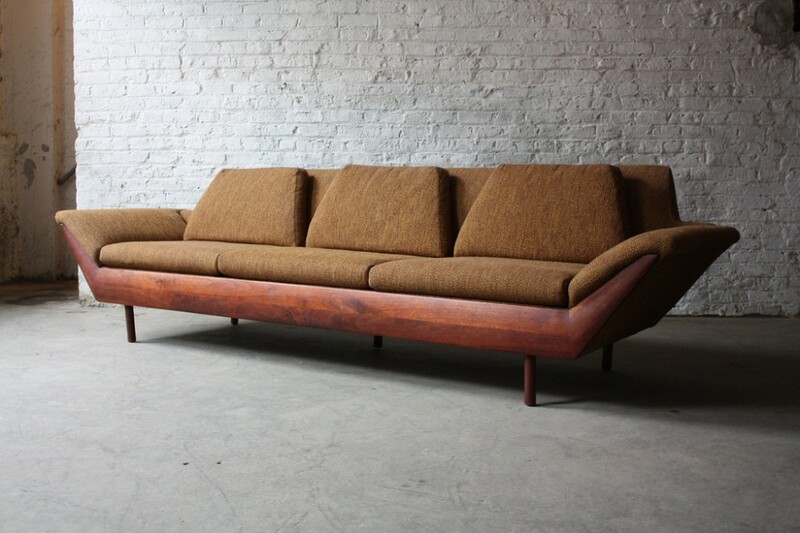 Many mistake this lesser known piece for a Pearsall creation like the Gondola couch, but the design is more angular. Think Jetsons, think Space Age. Either way, it’s an incredible piece of architecture.